Most Reverend Thomas L Grace, O.P. Leadership Past Bishops Most Reverend Thomas L Grace, O.P. Thomas Langdon Grace was born in Charleston, South Carolina and was ordained a priest for the Dominican order in 1839. 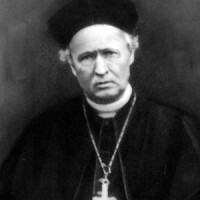 He became the second bishop of the Diocese of Saint Paul on July 29, 1859. Known to be an orderly and well-educated man, Bishop Grace organized the diocesan administration, set a precedent for Catholic education, and established a constitution for priests in diocese, stipulating norms regarding sacraments, as well as parish life. A capable administrator, he added stability to a rapidly growing immigrant Church in Minnesota and the Northwest. The Sioux uprising of 1862 as well as the Civil War were both defining moments in his episcopate. Exercising fine diplomatic skill, Bishop Grace worked for peace and unity among Native Americans and immigrant settlers in the Diocese of Saint Paul. At the age of 70 on July 31, 1884, he resigned as bishop of the diocese and lived until 1897.